When Robert Parker spoke at the annual Wine Writers Symposium last Wednesday, he opened with these words. While he meant well, such words would have been better suited to, say, the Wine Bloggers Conference. Or a high school English class. Eric Asimov, Ray Isle, Jon Bonné, and Karen MacNeil sat in the audience. As did Jay McInerney, one of the nation’s greatest living novelists. So did about a dozen magazine editors. As did Lisa Perrotti-Brown, Parker’s boss. This was the audience. Just 62 writers participated in the symposium. Those who follow wine would have recognized more than half the room. So while his intentions were good, the comment was stunningly patronizing. As Parker continued, he was personable, humorous, and disarming at times. But over and over again, he came off as divisive and dismissive. He said nothing to convince the crowd he’s more thoughtful than the stereotype he’s created for himself. Although the appearance was certainly memorable, it was disappointing. In discussing this particular screed, Parker told symposium attendees he wrote it “to encourage conversation on the subject… because we need to discuss it civilly.” He also cited this particular piece to tell the crowd that he doesn’t “like absolutists” – moments after telling us “truth” and “history” are on his side. The lack of self-awareness would be laughable if it weren’t so sad. With retirement so obviously on the horizon, wine writers — and consumers — expect more from Parker. We expect more because of the examples set by similar luminaries. We also expect more because Parker tells us to. Parker paints himself as an elder statesman – and acts like he wants to fill that role. But over and over again, he undermines that portrait. At the symposium, Eric Asimov, Ray Isle, Jon Bonné, Karen MacNeil, Jay McInerney, and others took part in all the events. They were eager to hang out with younger, less accomplished writers. Yet Parker vacated the symposium the moment his time slot ended. If only he could live up to his words. Excellent post, David. Ditto the previous two posts. Thanks for transcribing — and analyzing. As a fellow Symposium attendee, I’d like to stress that as an audience, we were quite respectful. I only wish Robert Parker had been more respectful of his audience of wine writers of widely varying degrees of experience and diverse readerships. From his first broad-brush allusion to wanting “all of you” to succeed, to spending 25 minutes recounting his entree into wine 3+ decades ago (a lovely but oh-so-old story), to his suggestion that the money in wine writing lay in homemade educational videos for Asians, to choosing not to participate in any other part of the symposium (right after saying he wished he knew more of us? ), the whole affair was a surreal. 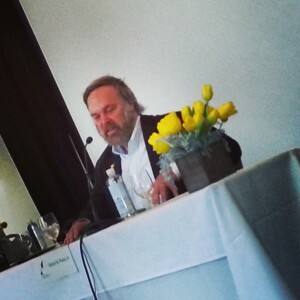 I do believe that all wine writers can, should and will continue to view Robert Parker with appropriate respect. But that does not mean he gets a pass — especially with regard to his continued habit of ranting against unnamed enemies. By doing so, he is avoiding addressing valid criticisms, period. I find it interesting that his greatest (only?) support of late comes from fellow adherents of the 100pt scale (which, of course, was barely a topic of discussion at the symposium because so few actual wine writers still use it). At one point, he waved his hand at an imaginary screen and referred to the idea of rolling a slide show of all the terrible things people have said about him. Huh? If vilification of Robert Parker is such a problem, why not counter these critics by name? Is it Alice Feiring? Jon Bonne? Tyler Colman? Alder Yarrow? Dan Berger? We don’t know, because Robert Parker would like to direct attention to evil straw men (often referred to using “bloggers” as code for amateur/unworthy writers) rather than to the reality that, as Jancis Robinson has explained, wine has become democratized. The revered 100pt scale has adopted and injected with an appropriate dose of reality by Cellar Tracker while the supposedly authoritative wine raters have turned it into no more than an inflated grading system turned marketing tool. Robert Parker’s past influence will always be felt in America. But his future is clearlly brightest in Asia, where a generation of new-to-wine drinkers will lap up his system of 100pt faux-precision and his self-professed affinity for intensity. Here in America, the wine scene is embracing diversity, both in wines and opinions on wine. Tish – Thank you for the thoughtful comment. The 100 point scale has a role in assisting wine drinkers in selecting from a very wide retail offer of wines, most of which they have not heard of, labelled in languages they do not speak, at prices that are quite expensive relative to Europe or North America. The 100 point scale has a role in Asia as a pathway to creating the “diverse” environment that you speak of. Could we argue that it played this role in North America? As regards overly concentrated or “intense” wines, i share your genera sentiments I would note that the monthly tastings we do with a broad cross section of consumers in China (none of whom are in the trade) indicates a strong preference for fruit forward or concentrated wines. They consistently score well. What really irks me is the Parker reactionary position. You know the reason that a few grapes are so famous is that the English wine trade controlled fine wine for centuries, they also mostly traded in Bordeaux and French wines. These obscure grapes he disdains are obscure becuasue the trade for hundreds of years was controlled by a few people who created the market for so called fine wine and they were based on Bordeaux and Burgundy as well as Some from Germany, Spain and Italy. I am sure that if global commerce had somehow been constructed differently and the English did not control Bordeaux, then maybe Teroldego would be the wine of the rich and famous. Parker’s argument is based on a paradigm based on the way that the world was organized politically and comercially for hundreds of years. His hackles are up because he can’t honestly comprehend that some people genuinely love leaner and more acidic or what ever wines. I don’t begrudge him his love of cough syrup and he should leave us lovers of a different style alone! “Jay McInerney, one of the nation’s greatest living novelists” made me laugh out loud. David: thanks for taking the time to recount all the details of Parker’s address and for your citations highlighting his blatant contradictory statements. I think perhaps most consumers have moved on from Parker–at least with the “younger generation” of wine drinkers and If I had to put an age range in place I would say, those under 40, give or take. For many over 40 (give or take! ), his scores still ring out as the be-all, end-all, or at least as a helpful gauge. Then again, many of these consumers (esp those in their 50s, 60s, still buying wine to age) matured in their wine preferences along with Parker, leveraging his Wine Advocate as their primary reference for what to buy, etc. He’s useful as a reference–a mark in history, a turning point in wine criticism, a watershed…and why? Because he is so polarizing? Perhaps. Because he speaks truths? Who’s truths? It certainly takes personality to deliver a keynote to a roomful of the many talented and equally important writers he addressed by beginning with such a patronizing opening line. And yet: what kind of the performance would he be remembered for if it were not for a polarizing one? It’s all right in step with his entire career and I think of it as just another play upon the stage. You know… that whole… All The World’s A Stage story…? Leave it to Hosemaster to beat me to the punch(line). Bravo David, one of the most direct of the slew of articles on this event. Thanks for being candid, speaking your mind, and not pulling any punches. For the first time in my life, I kinda hope RP keeps making more public appearances…. Why would he need to admit this *more* than once? Why do we expect RMP to change now, so close to retirement? WYSIWYG with him, and he’s been consistent in his inconsistency with the changes in wine media since, well, forever (at least since I interviewed him a few years ago, anyway). I guess what I’m saying is this: if we’re disappointed in him for continually being what he is not, then we’re probably being unrealistic.